It has now been forty-three years since Ferdinand Marcos imposed martial law to breed and reign terror on the Philippines for more than eight years. Martial law is lauded as a time of progress in Philippine history, but what is too often forgotten—or outright silenced and erased—are the victims of human rights and their realities of political imprisonment, disappearances, torture, and even execution during this time. 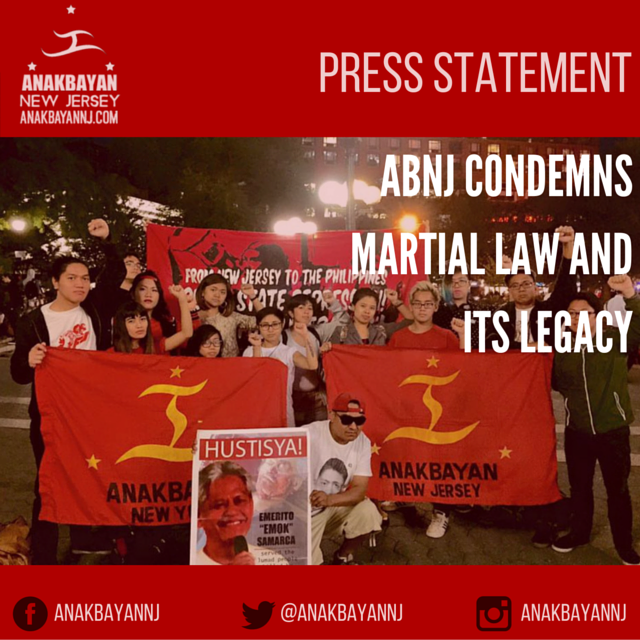 We, the youth and students of Anakbayan New Jersey (ABNJ), condemn martial law and uplift those who have struggled against it, in the past as well as today. On September 21, 1972, Marcos declared martial law under Proclamation No. 1081 under claims of “lawless violence” and “armed insurrection and rebellion” by suspected communists, thereby seizing absolute power as dictator until the declaration was lifted on January 17, 1981. Peace and order were fiction during this time, and in fact the opposite was happening: there were over 70,000 individuals arrested; 34,000 tortured; 3,240 salvaged or executed; and 1,000 disappeared under Marcos’s fascist state, according to Amnesty International. Another red scare has been bred by the current president, Benigno Aquino III, and the counterinsurgency program Oplan Bayanihan terrorizing Lumad (indigenous) communities in Mindanao. It should be no surprise that the United States has supported martial law and Oplan Bayanihan. Marcos was also praised for increasing the economic growth during martial law: from 1965 to 1971 the average growth rate was 4.9%, while it leaped to a 5.7% average from 1972 to 1981.3 In 1983 and 1984 after the Marcos regime defaulted on its debt, GDP actually fell to a devastating negative 7.3%. One of the effects of this economic decline was a sharp widening of the gap between the poorest and richest. The poor got poorer, while the rich got even richer. This economic gap lives on to today. Martial law set a legitimized a pattern of impunity that is still the order of the day as Lumads are killed by the Armed Forces of the Philippines and paramilitary groups. Funny, however, that the current Aquino regime recently echoed the popular call of “never again” to martial law, patting themselves on the back. We call on everyone to sign the Unity Statement to condemn escalating human rights violations. Condemn Oplan Bayanihan and the killings of lumads in Mindanao as legacies of martial law. We as ABNJ acknowledge the long-lasting impacts of martial law under Marcos’s dictatorship and call for all people to stand up for human rights in the Philippines. Boyce, James K. 1993. The Philippines: The Political Economy of Growth and Impoverishment in the Marcos Era. Honolulu: University of Hawaii Press. World Bank estimates based on IMF balance of payments data.